Gluing pieces of wood back together is one thing... stripping off a 50 year old finish and redoing it with a spray can of lacquer is another. I'm not so sure this is a good idea. But the wife says it's ugly. All taped up and ready to be destroyed. There it is after a couple hours with 60 grit sandpaper. 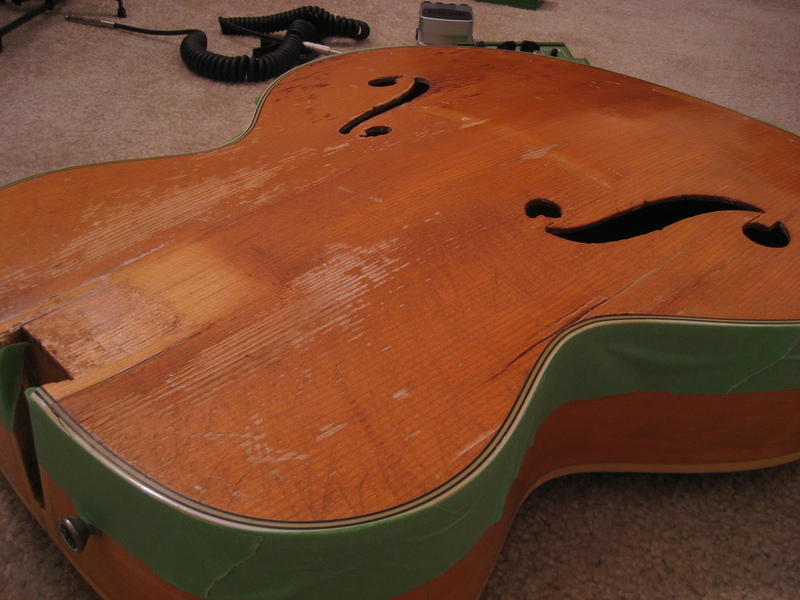 Most of the stains in the treble have been sanded out and the only thing that really stands out is the long cracks I superglued in the middle. The lumpiness in the center prevents those cracks from getting sanded flat so the glue shows a bit. There's still a few darker patches here and there where the old finish isn't quite gone - again, due to the lumpiness. Another couple hours of grinding on it should smooth it out. 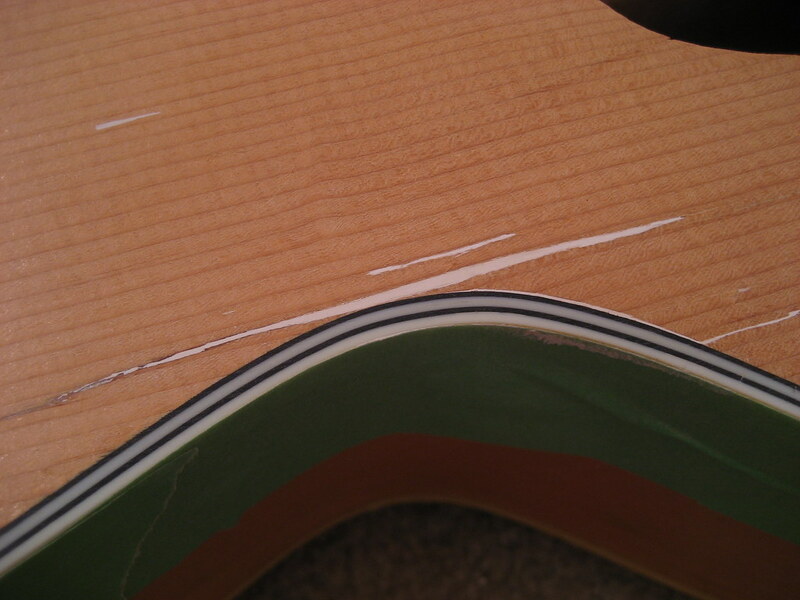 Good thing spruce is a soft wood. Once I got it sanded down to 220 grit it was still a little rough. So I wetted the wood to raise the grain, then made another pass at 220 grit. When I did this a bunch of little pieces of the grain ripped up. Here's an example. 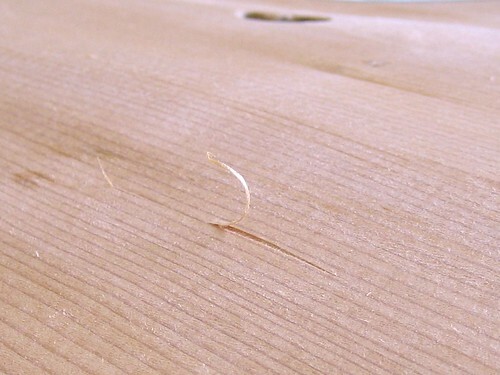 Spruce is really weak and wet, sticky sandpaper just destroys it. It's not natural color at all. It's just white. This didn't really occur to me while I was applying it. 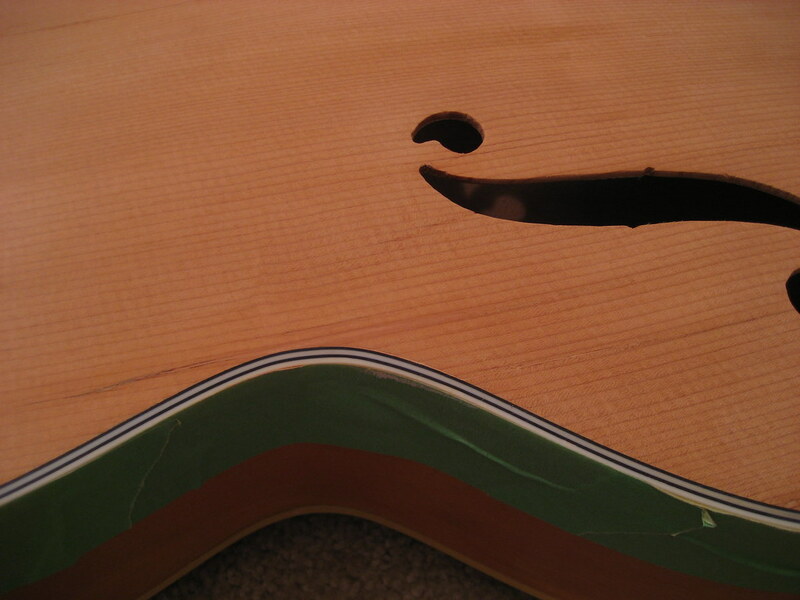 When the wood is wetted down (to emulate the final lacquered appearance) it's really obvious. This putty thing was a mistake. Death to the old putty, long live the new putty. 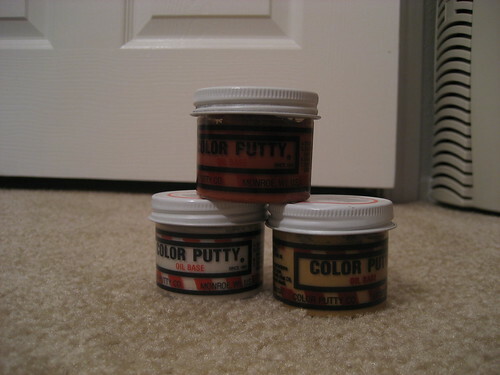 This stuff is an oil-based putty that comes in a bunch of wood colors. You can mix the colors together like pain to get the right color. It dries, but not really very hard. The big crack is still noticeable but the rest of the top looks great. Even wetted down the putty isn't noticeable unless you're looking very closely. 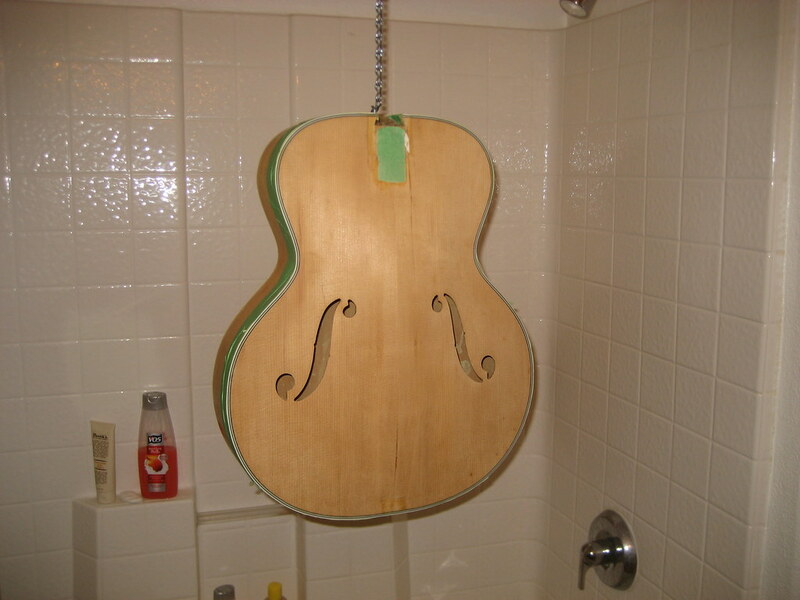 I can't say how it will look with lacquer but it could be worse. 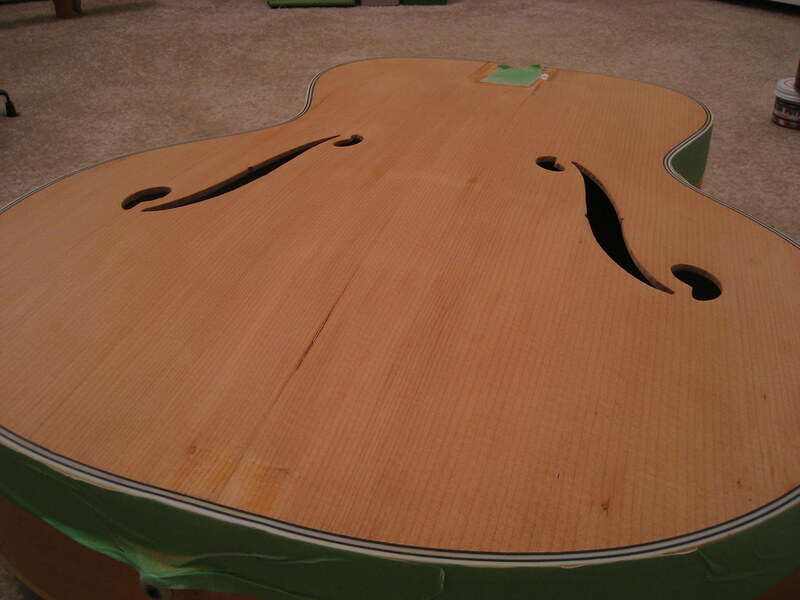 Cracks are filled and everything is sanded down with 220 grit. I put a screw into the neck block so that I can hang it in my high-tech finishing chamber. I'll have to put some newspaper down before I start spraying. 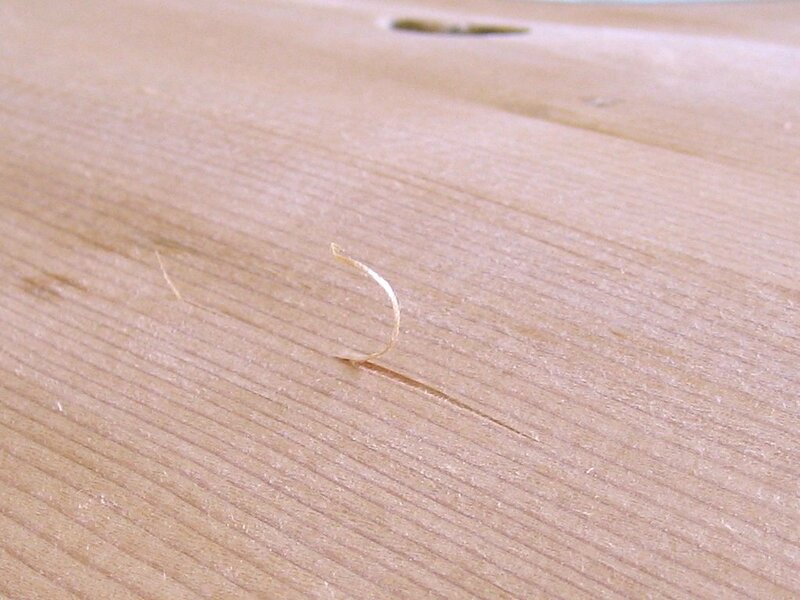 No grain filler since spruce is a tight-grained wood. 4 coats of sealer (ColorTone Aerosol). 45 minutes between 1st and 2nd coat, 2 hours between subsequent coats. 8 coats of lacquer (ColorTone Aerosol). Again, 2 hours between subsequent coats. 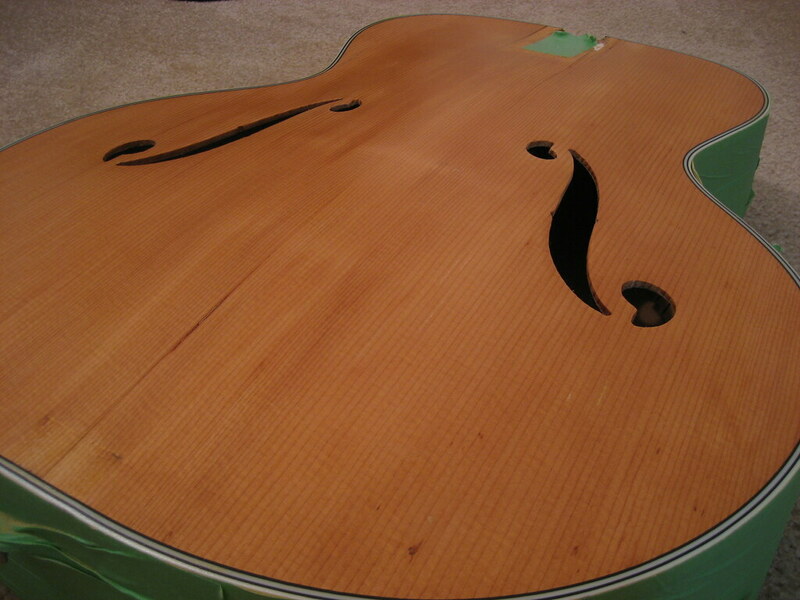 Sand (800 grit, wet sanding) and buff final finish. 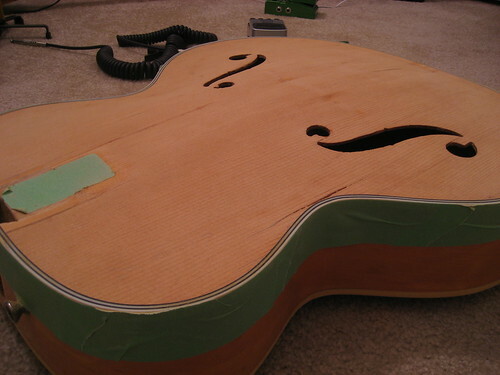 You'd think there would be sanding between coats. Fresh nitro reacts with the nitro layer below it to kind of melt together, I think. Here it is after 4 coats of sealer and 5 coats of clear coat. I've been leaving 4 hours or so between coats since that is recommended on the can.